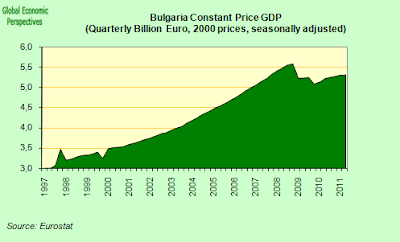 The latest round of EU GDP data, brought to light a reality which many who have been closely following the economies of Eastern Europe already suspected: that the heavily export dependent economies in the region would almost inevitably be dragged down by the rapid slowdown in Europe’s principal economic motor, the German economy (see this post for background). The Czech Republic, Hungary, Slovakia, Bulgaria and Romania all reported slower GDP growth in the second quarter, due in large measure to the disappointing performance of their German neighbour, central Europeâ€™s most important trading partner. As anticipated on this earlier blog, the Hungarian results were especially weak. Analysts had widely predicted interannual growth of just under 2.5%, but in the end the result came in at 1.5%. Even worse, the economy completely failed to grow in the second three months in the year, since quarter on quarter growth was effectively zero. Thus the increase in industrial activity which accompanied the increased demand for exports was only sufficient to compensate for the drop in internal demand, and this at a time of near record export levels in many European countries. This is doubly worrying since the government, while continuing to reduce the deficit, has appropriated something like 9% of GDP from a one off pension move, paying down debt and, in addition, adding some support to this years spending programme. This factor will not be there to assist growth in the years to come. This post will examine the growth performance in a number of the region’s economies, and attempt to extract some useful conclusions for what we can expect to see in the region in the future. Mirroring what just happened in Germany, second quarter GDP growth in the Czech republic slowed from what had been the fastest pace in almost three years achieved in the first three months of the year, to a mere 0.2%, the slowest rate of increase in two years. While the economy grew 2.4 per cent from a year earlier, compared to 2.8 per cent in the first three months of the year. Like many economies in the region, the Czech one is now strongly dependent on foreign demand for its products. 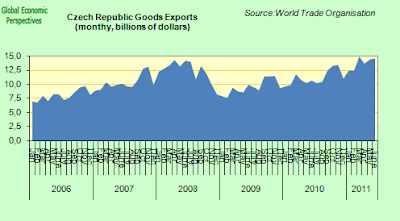 Exports have surged back up and beyond pre-crisis highs, while industrial output has grown strongly. 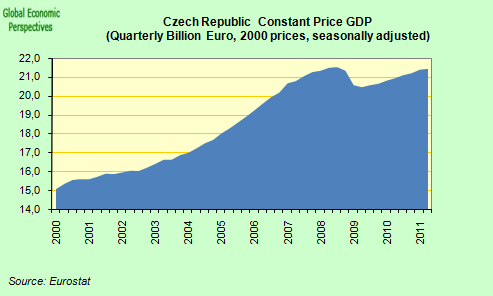 What makes the Czech case interesting is that neither the private nor the public sector is heavily indebted – public sector debt was only 41.3% of GDP in 2010, and the country’s external debt was only 46.7% of GDP. Nor is the country facing an “investor strike”, the central bank policy rate is currently 0.75% , and far from this deterring people from holding the currency, the Koruna has gained nearly 2.4% against the euro so far this year, as compared with a decline of around 10 per cent in the Polish zloty. Indeed some are even talking of the Koruna as a potential safe haven alternative to the Swiss Franc. The government deficit has been over the EU 3% limit (it stood at 5% of GDP in 2010) and recent government austerity measures to reduce this level have undoubtedly played some part in the slowdown, but this on its own is not enough to fully explain the velocity of the reduction. 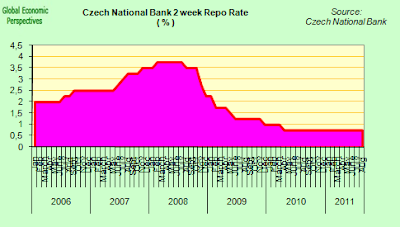 As I argue in my most recent post on Germany, export driven economies are inherently volatile, and what has happened in the Czech Republic is an almost classic example. But why is the country export dependent? Well, there are probably as many answers offered to this question as there are economists, but my own personal view is that demography is the key. 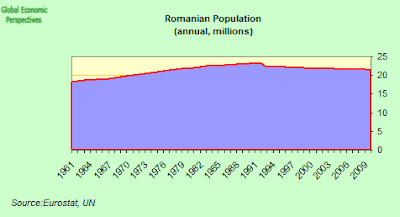 After decades of very low fertility, the country’s population is ageing rapidly, and by 2020 the median age will be nearly 45, making the Czech Republic the second oldest nation in the region, after Slovenia. Many will see no significance in this fact, but from where I am sitting the association is not simply coincidental (see this working paper from Claus Vistesen). 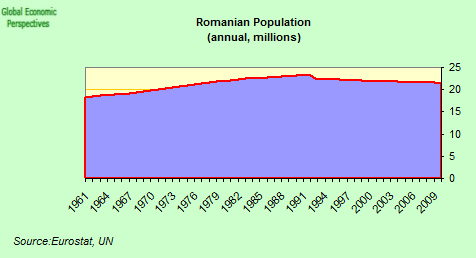 A number of “stylised facts” can be extracted from the Czech example. In the first place, if we look back at the q-o-q GDP chart (the orange/red one), what is most noteworthy is how the rate of quaterly growth since the crisis has fallen to about half its prior level. This, in an economy without major debt problems and with a fairly competitive economy must give us some idea of what the “new normal” looks like. GDP growth is much lower, and likely to remain lower (on average) as far ahead as the eye can see. In the second place, construction output is down (and falling). This also seems to form part of the brave new world we now live in, at least as far as most of Europe, the US and Japan are concerned. A house is once more becoming something you live in. 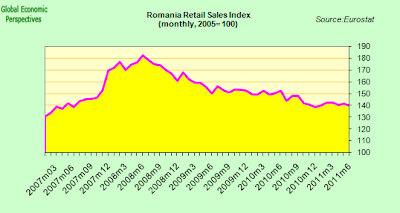 And thirdly, as I say, domestic demand is falling steadily, as reflected in retail sales (naturally in the more heavily indebted economies this situation is worse). This weakness in domestic demand is unlikely to be temporary, and those waiting for a turnaround would do better going and waiting for Godot. This persistent weakness in domestic consumption is all the more striking in the Czech case, given that real GDP is now almost back at pre-crisis levels. 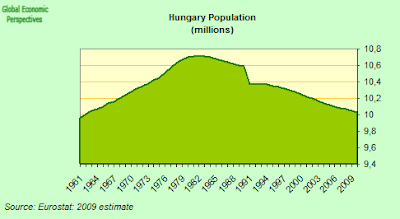 The Czech example is illustrative, since it is one of the best case scenarios, and unfortunately, when we look at the regional neigbours, we find that in general things only get worse. 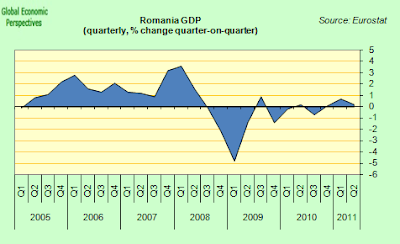 Romania has struggled far longer than any other CEE economy to emerge from recession, only grew (q-o-q) by 0.1%, following a 0.7% quarterly rate of increase in the first quarter. 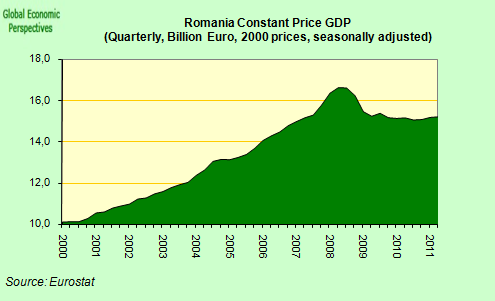 Even though there is some discrepancy between the data published by the national statistics office and by Eurostat, it is clear that Romanian GDP is barely up from one year ago. And indeed is still something like 8.5% below its pre-crisis peak. 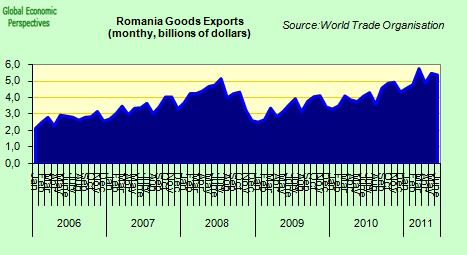 This despite the fact that exports have been booming, and are now above the pre-crisis level. 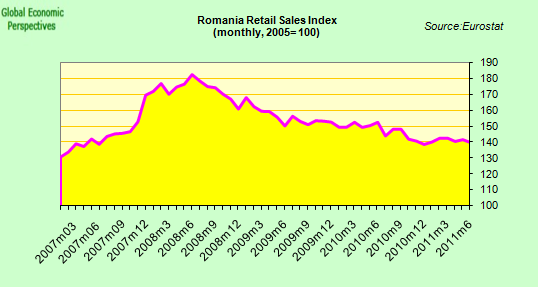 As per the regional pattern, domestic demand has not recovered and retail sales are falling. 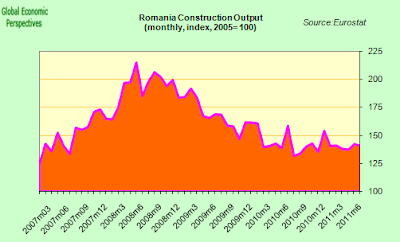 Construction is well down, and is unlikely to return to pre-crisis levels. 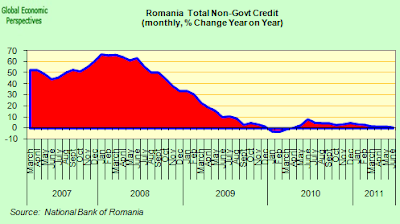 But Romania and the other countries we are about to look at suffer from an additional problem – the have significant external debt levels, and despite the activation of the so called Vienna initiative they continue to suffer from very tight credit conditions. 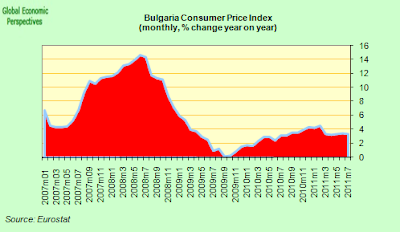 and inflation has been far higher than is desireable, given that the country cannot easily devalue to restore competitiveness given the external debt exposure. 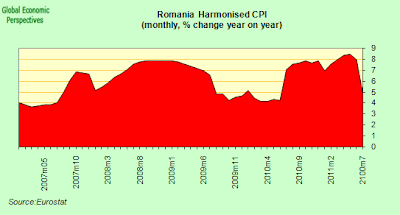 True, the inflation rate was exacerbated by a 5% VAT rise in July 2010 and the annual rate has now fallen back from 8% in June to 4.9% in July, but I really would question the wisdom of the widespread recourse to VAT rises made by the IMF, since while they do offer a fairly quick short term fix to deficit issues, they only compound growth and external competitiveness problems, in particular in cases where devaluation is not a quick’n easy option. while interannual growth slowed to 1.9% from 3.4% in the first quarter. 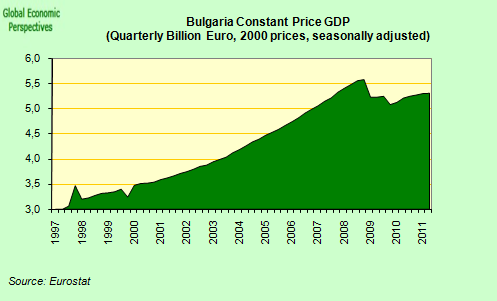 Bulgarian GDP has recovered rather more than it has in Romania, but at the end of June it was still more than 7% down from the pre crisis peak level. The explanation for the weak recovery is the same as elsewhere, with domestic consumption stagnant, and retail sales in tendential decline. Construction has also slumped significantly. 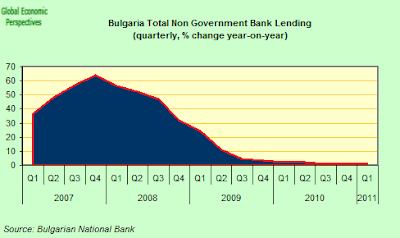 In addition to the credit crunch which is to be found elsewhere, Bulgaria faces the added difficulty that many banks are Greek owned, and are themselves facing a liquidity stretch at home. Yet despite the Euro peg the country continues to run a sizeable inflation rate, and competitiveness – as measured by the REER – continues to deteriorate. Thus an export sector which in value added terms is already too small for the job it has to do is facing headwinds which don’t exactly encourage expansion. 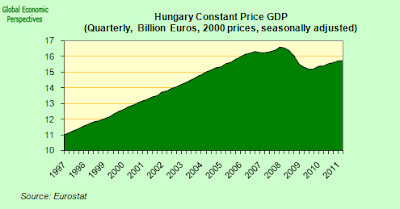 Hungary’s GDP growth basically stalled in the second quarter (0.0% q-o-q), taking the year-on-year rate down from 2.4% to 1.5% in the first quarter. 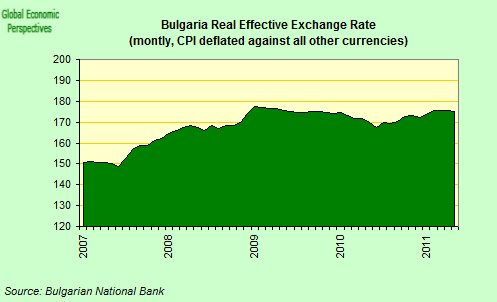 This is well below consensus expectations (2.5%) and also worse than the central bank forecast of around 2.2%. The pull from net trade evidentally weakened substantially, and in an economy that only has one cylinder to fire on (exports) this makes itself noticed quickly. 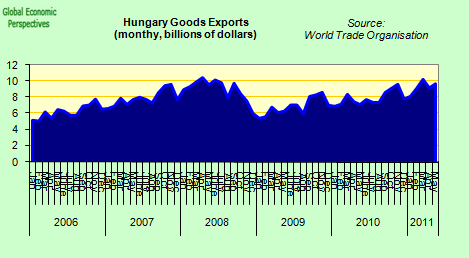 Hungarian exports have risen well since early 2009, but in recent months growth in both these and industrial output has tapered off. 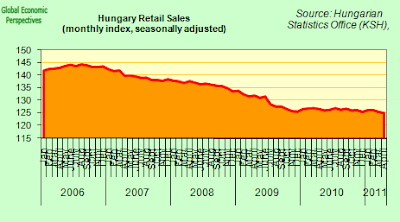 Hungarian GDP is still over 8% down from the pre-crisis peak. 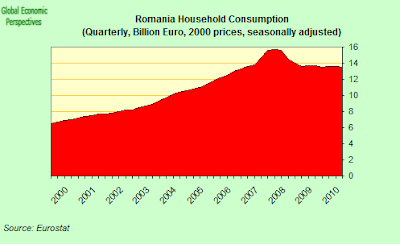 Household consumption has not recovered at all, and retail sales continue to fall. 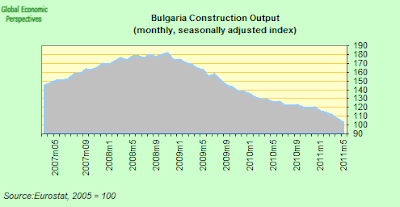 Again, construction activity is trending down. 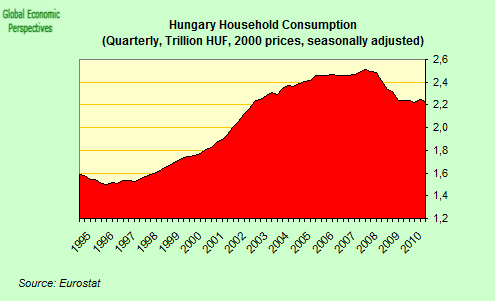 The Hungarian current account has recovered considerably, and the country now runs a surplus, unfortunately not a large enough one to underpin stable growth. The stock of CHF private sector loans is equivalent to approximately 20% of GDP, most of it made up of household loans (18% of GDP). Roughly half of these loans are mortgages, and the other half consists of home equity loans. 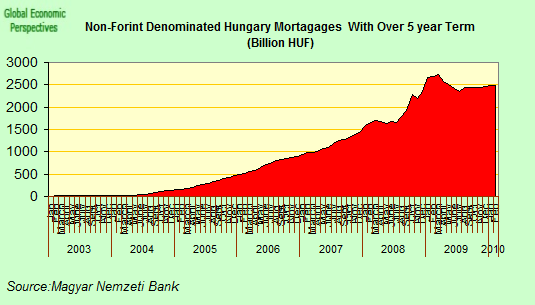 As shown in the chart below (housing loans only, but representative of the whole), most of these loans were contracted in 2005- 08, when the consensus view was that the forint was in a secular appreciation trend versus EUR as well as CHF and Hungarians felt safe about borrowing at much cheaper foreign interest rates. People were focused on the repayment size, and not the capital value movements, rather like people have recently been focusing on public deficit issues, without thinking too much about debt dynamics (until Italy came barging along, that is). In 2005, the average rate for a home equity loan in CHF was 4.8%, compared to 6.2% in EUR and 17.6% in local currency.The upward surge in the CHF together with increases in interest rates on CHF loans since these were intitially taken out means that the repayments on these mortgages have risen significantly. 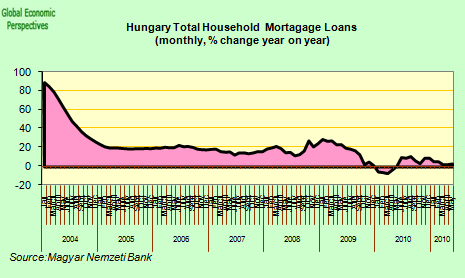 Morgan Stanley estimate that the average repayment on a CHF mortgage taken out over 2005-07 is up over 50%. Carrying out some simple back-of-the-envelope calculations they also arrived at the conclusion that servicing this debt at an 8% interest rate costs Hungarians around 2% of GDP every year. Absent the adverse FX shock, servicing costs would have been around 1.4% of GDP. The 0.6% difference can be seen as a kind of growth penalty, hamstringing what would already have been pretty weak domestic consumtion. According to Morgan Stanley calculations, the rise in CHF since 2008 has had the equivalent impact on Hungarian FX borrowers of a 6% rate increase. 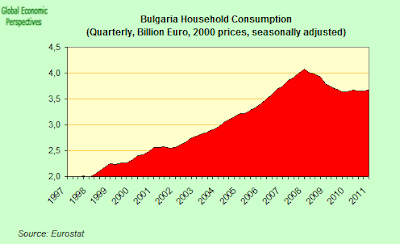 And it isn’t only householders who are suffering from Forex risk. 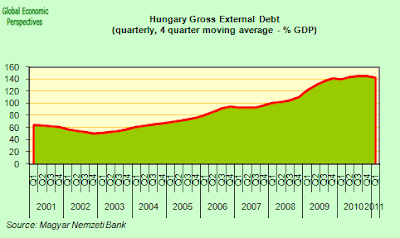 Hungary’s gross external debt is around 135% of GDP. 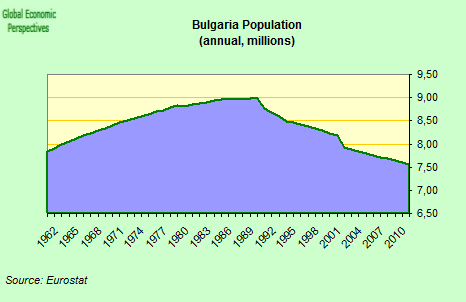 The country has the largest public debt in the region (around 80% of GDP), and although one off measures with the pension system mean that this will fall this year, the upward path may then resume unless the country has a growth revolution. Worse, 45% of public debt is not in Forints (and some of it is even in Swiss Francs), meaning that currency depreciation risk exists. All in all, it is very had to see the country being able to find its way onto a sustainable debt path. Drifting Towards Export Dependence Too Slowly For Comfort? The recent enthusiasm we have seen for the East European model has a nasty and worrying precedent, since in the years leading up to the financial crisis those who lauded the merits of the European Unionâ€™s newest members were not few in number. They were seen as the high-growth members of the Union who had learnt the costly lessson that big government was to be strenously avoided. Such was the enthusiasm that even the very evident and very substantial current account deficits were considered almost benign. But then, as even, after pride came the fall, as one country after another had financing difficulties and became forced to call in the IMF. Now countries in the East are cited for their low debt, and capacity to accept sacrifices in avoiding excessive deficits. Two issues stand out as important: the prevalence of unhedged forex debt and the regions unique demographics. Just like in the Euro Area’s Southern Periphery the presence of forex borrowing severely limits devaluation as a potential competitiveness restorer, while ageing and declining populations mean that the economies are increasingly export dependent. This means they often have both increased exposure to global slowdowns (or recessions), combined with an external financing dependency when sources of funding may rapidly dry up. Evidently, societies with young, growing populations can hope that the sheer pace of economic growth will eventually burn down their debt, but societies with shrinking populations, and rapidly rising elderly dependency ratios cannot adopt such a complacent attitude. Older societies are normally lower growth societies, and in addition, with the number of people of working age falling and falling, an ever greater burden falls on an ever smaller labour force. All four countries in our sample are pioneeers in this regard, sounding out the frontiers of a world in constant decline, a world which is ever older. Isn’t this the pass-through from the general deflationary adjustment of intra-eurozone trade? Czechland, Slovakia, etc are often said to be exporters to the “German locomotive”, but it would be more accurate to say they are exporters to Germany’s customers at one remove. Their export sectors are dominated by companies that are either suppliers to the German automotive sector, or else offshore assembly plants for it. In so far as VW or Daimler Benz’s export customers are catching cold, that’s going to be transmitted up the supply chain. Rather like the ship’s captain waking up with a headache, taking it out on the first mate, and so on down the ship until the youngest deckhand kicks the cat over the stern. The IT sector’s already seeing both Apple and HTC cutting their orders for semiconductors and also semiconductor inventories rising higher up in the supply chain, due to crappy trade in their customer markets. 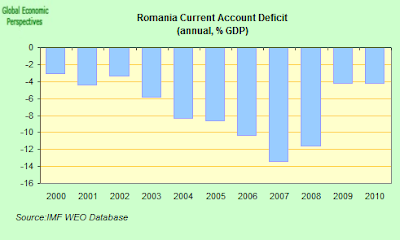 If you demand that the CA-deficit countries reduce their CA deficits without anyone else changing anything, this is what you’ll get. As far as Germany itself goes, it can cushion the impact because it’s pretty diversified. But if 30% of net exports and a significant chunk of GDP are one big subcontractor for VW-Audi you’re screwed. Of course, if you’re not in the Eurozone you can devalue, but the problem isn’t price so much as volume. If your products make up 10% of the final price of a car, even a 30% devaluation won’t be enough. And there’s the whole CHF credit card insanity.